I’m pretty competitive and my favorite person to compete against is myself. I think that’s why my favorite sports I’ve done have been cross country, track, and swimming. I get to race other people, but at the same time, I’m competing against the clock and competing against my past self. I did a race called the Tar Heel 10 Miler two years ago, when I was a senior in high school. I ran the 10 miles in 68 minutes, went home to shower and eat lunch, and then immediately headed to my conference track meet. At the meet, I ran the 2 miler in 12:30 (about 45 seconds slower than my best time that season, but that’s more or less what I was expecting because of the 10 miles earlier that day). The 2 miles was honestly harder and more painful than the 10 miles had been just because I was really tired at that point, but I remember feeling on top of the world afterwards. I was in tip-top shape, running 7-8 miles per day, with at least one hill workout and one speed workout per week. I was foam rolling and stretching like crazy. And I was sleeping 8 hours each weeknight and 9-10 on the weekends. The morning after my double race day, I woke up more sore than I’d ever been in my life, but still feeling great about the previous day. 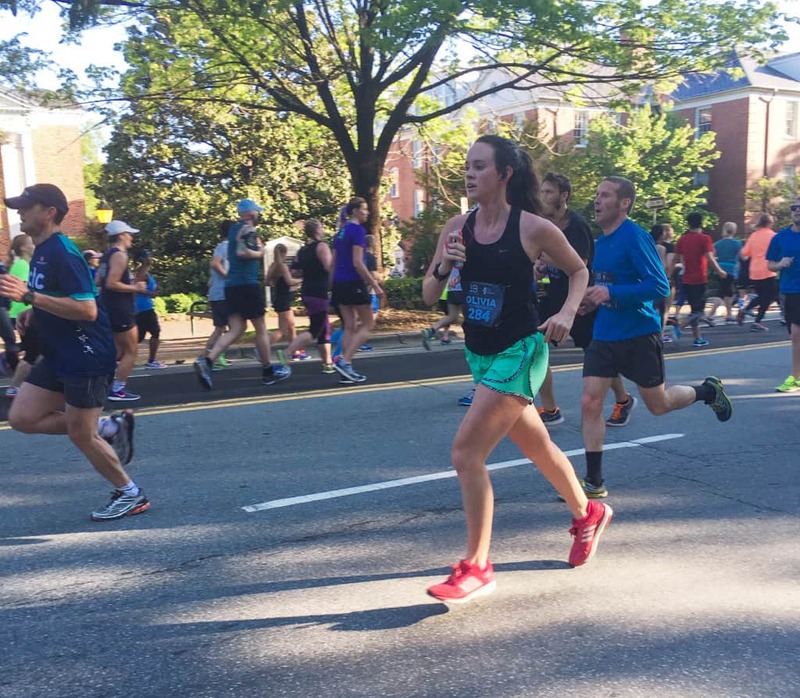 So, that takes us to this Saturday when I ran my third Tar Heel 10 Miler. It’s an awesome course that goes right through my school’s campus and the starting line is just half a mile away from my dorm. Things were a little different this time around, though, because doing any type of specific training for the race hasn’t been a priority for me this semester. The last time I ran 10+ miles was during my most recent half marathon…which was in November of 2014. These days, I’m running an average of about 5 miles per day at an easy, chatty pace. I do zero speed or hill workouts each week. I sleep about 6-7 hours per night. A week or so before the race, I started wondering why I’d signed up because clearly I hadn’t made time to really prepare for it. Due to my competitive nature, I’ve never once just done a race “for fun” because I’ve always thought that the definition of fun = beating my previous times. Some of you might be wondering what’s wrong with this girl, but I have a feeling that some of you know exactly what I’m talking about. For this race, I knew there’s no way I’d run it like I did two years ago. And to make matters worse, there’s an infamous hill near the end of the race that lasts for nearly a mile. For the first time, I decided to let myself race “just for fun.” I took 2 quick water breaks at the aid stations, which I’d never done in a race before. I also paused at least 5 times on the side of the course, hands on my knees, to cough my lungs out and attempt to breathe (allergy season). I’d like to take a moment to sincerely apologize to every runner around me during those times because, gross. I finished in about 80 minutes– a full 12 minutes slower than my best time. And I woke up the next morning and still, somehow could hardly walk. 1) I realized life has seasons and this season happens to be one that involves a lot of late nights because of homework, work, and time with friends. My GPA, debit card, and happiness depend on those three things, respectively, and so I wouldn’t trade them. 2) I remembered that I run because I LOVE it– not because I need to prove something to myself, like that I’m capable of running faster or working hard or anything else. I run because it makes me happy, keeps me centered, and it helps me stay healthy. 3) I had fun! Since I hadn’t done a race in about 1 1/2 years, I’d forgotten how much I love the environment of being around a ton of other runners and I definitely got bitten by the race bug again. There was lots of live music and spectators cheering, which made it a fun environment. Spectators’ signs always make me laugh, like one that said “Run faster. If you pass out, I’ll pause your Garmin” (#runnerjokes). Running the race was a great way to spend my Saturday morning and since it started early in the morning and was so close to my dorm, I even got to hop back in bed for a little while afterwards. In any case, I realize I’m the only one who cares about my race times so that wasn’t the point of this post. I mostly just wanted to share my experience of how freeing it’s been to let go of some perfectionist tendencies. My high school self would’ve been mortified that I was sore after running 10 miles at an 8:00 pace, but my current self knows that I’m the one who arranged my priorities for the semester and training for a race just wasn’t one of them. And that’s okay. I don’t think there’s anything wrong at all with training for a race and wanting to do it really well– I’d love to do that soon! But I think it’s also important to cut yourself some slack during extra-crazy times of your life. These past couple of years have been about allowing myself to relax and cut myself some slack when I can’t do everything perfectly and this race was one of those times. Doing the best that I can at the time is great– I don’t have to outperform myself! If you’re like me…practice giving yourself some grace, okay? Are you a competitive type? What’s the last race you did or the next race you have coming up? What’s your ideal race distance? This race’s slogan is “10 is perfect” and I might have to agree! Do you have any similar struggles? I love that you remembered why you run and that’s because you love it. I think I forgot about that in light of me trying to be so competitive for many years in running (I’m not really that competitive in any other area), and I lost the joy of running. Lately, I’ve been running watch-less for about 6 months, and it’s been a freeing time of refreshment and just enjoying God’s creation. Lord willing, I hope to do a half in a year or so, but I want to take it on with a completely different mindset. 🙂 There are also different seasons like you said, and it’s AMAZING to see that you are embracing it. Congrats on your race! I think running just for fun and not trying to beat the clock is important sometimes! I LOVE everything about this. There are so many different seasons in life and structured training is not meant to be in every single one. You love running and that’s all that matters. The best races for me are the ones when I haven’t put pressure to perform a certain way. I agree, 10 miles is a perfect distance! Thanks, Faith! It’s almost embarrassing how sore I am…stairs are my worst enemy today and I’m avoiding walking down them whenever possible! 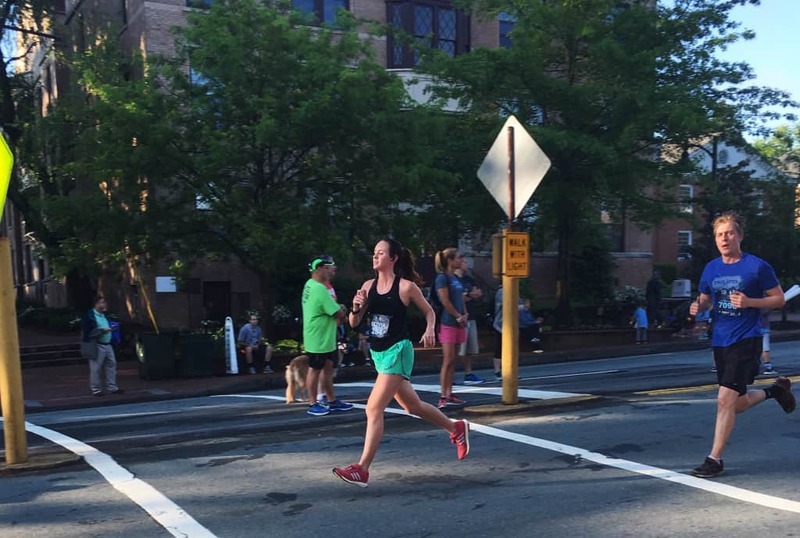 Congrats on the 10 miler – that is A BEAST of a race, especially that uphill! I did it two years ago. I’m competitive for races I’ve done in the past and I want to beat my previous times, but just last month, I went through the same thing and ran the Cooper River Bridge Run much slower than my previous time. It happens, and I realized it was more about the destination and fun of it anyway! I’m glad you had a similar experience and fun race last month! This was a great read Liv! I love your passion for running and it is so awesome that you were able to do this race just for the fun of it! Thanks, Sarah! It was a different experience for sure, but I really enjoyed it! Love this! I really hope to get back to working out with a purpose outside of saving my sanity during the summer. I don’t know if that means strength goals or running goals or both, but I fully recognize that there are seasons of life where training is not a priority, and the school year is one of those seasons for me! So glad you had a fun race 🙂 Good luck as you finish up the semester! Agreed! You said it perfectly– it’s mostly just about stress relief during the school year, too. I hope to start training for a race during the summer, too, but of course then it’ll be the hottest time of the year, eek! Great job on the race Liv!! 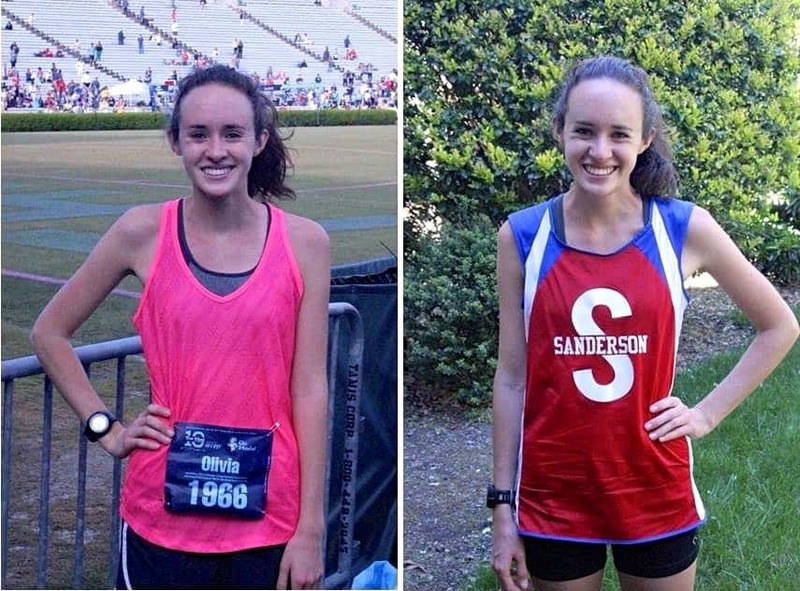 The kindness you gave to your body just shows the maturity and growth you have, Liv! I think that is lovely. Holy smokes that’s a lot of running in one day (like, seriously more than I do in a year). But it is so admirable that you are freeing yourself of your perfectionist tendencies. I can relate 100%. Health is more than just physical! Agreed that health is much more than physical– there’s a huge mental component! Girl, way to go for changing your perspective and focusing on the positives! Winning or beating your time isn’t everything – you can do that with the worst attitude in the world and come out of the race feeling woeful or you can do what you can with the best possible attitude and focus on WHY you’re running not HOW. You still got out there and finished, that’s so much more than so many others have done! Thanks so much for your encouraging words, Kristy! But when it comes down to it, my biggest competition will ALWAYS be myself. Its my own brain that I battle on a day to day basis, and sometimes I come out on top and sometimes I don’t! Haha! That’s funny that you’re competing with the other people in your class without them even realizing it 🙂 But yes! Self-competition is so real and it can be a really good thing…or it can become too much! great post Liv! I think its important to have times in your life where you don’t succeed as well as you would have liked, or would have expected to. It keeps us humble, and also reminds us that it’s not the end of the world. I am HELLAAA competitive so i fully understand where you’re coming from. Whenever i hear the words ‘first place’ my palms literally start sweating. haha. im so lame. Yes yes yes!! Wise words Liv! I’m so glad that you were able to let go of perfection and just have fun with it!! Sounds like a blast! Hope that you are having a good week so far! Thanks, Cailee! Hope you’re having a great week, as well, and a good end of the school year! That sounds like an awesome time – especially since you could go back to sleep afterwards! I like to compete with myself, but I know I will never beat most people, so I find it more relaxing than anything. In a way, I’m glad I didn’t play sports in high school, because now I can enjoy running as an adult because I don’t have any bad past experiences. You said it perfectly- “The only person I need to be better than is my last race – and sometimes even that doesn’t matter!” Love that! I love this. I’m so glad we are both growing in this way. There is so much more to life than winning! Perseverance to finish is one thing I see more important. That value is a lot more likely to make us well rounded people than the desire to win. holy crap high school you was insane/amazing! that’s an awesome story 🙂 of course you are definitely STILL amazing, but its crazy how priorities change. i’m the same way, i still haven’t raced without *racing* but i dont think i really will. i run for fun, and sign up to really race and push myself. also,, i’d be happy to finish 10k at an 8:00 pace, so you still did great, and you DID accomplish something else- ran a race for fun!! Great point that races are a good time to sign up and really push yourself because you can run just for fun at any time for, uh, free 🙂 But if you ever find yourself somehow signed up for a race when you happen to not be in the best shape, maybe you can run it just for fun then! This post makes me want to get back out there. I haven’t been on a run in a couple of weeks since it has been raining.